A recent report on home sales says the number of homes sold in Canada rose in March after a sharp decline in February, but the average price of a home in Calgary dropped over the same period of time. According to the Canadian Real Estate Association, home sales via MLS increased by 0.9 percent in March, with much of that activity focused in Victoria, the GTA, Oakville-Milton and Ottawa. Sales dropped in a number of other major cities such Greater Vancouver, Edmonton, Regina, Saskatoon, London and St. Thomas, Sudbury and Quebec City. “While the mortgage stress test has made access to home financing more challenging, the good news is that continuing job growth remains supportive for housing demand and should eventually translate into stronger home sales activity pending a reduction in household indebtedness,” said Gregory Klump, chief economist with CREA, in a release. The report also indicated that the supply of homes on the market is continuing to have downward pressure on prices, particularly in the Prairies. Benchmark prices were down by 4.9 percent in Calgary, 4.4 percent in Edmonton, 4.6 percent in Regina and 2.7 percent in Saskatoon. CREA says prices will remain relatively weak in these centres until balanced conditions are achieved. Earlier this month, the Calgary Real Estate Board released its own housing report and found the same oversupply was driving prices down, but there were increased sales for “more affordable product;” detached and attached homes priced under $500,000. CREB says new listings were impacted by slow sales activity, but not to the point where current inventories saw a significant decline. “If new listings continue to slow compared to sales, it could start to help with the persistent oversupply scenario weighing on our housing market,” said CREB chief economist Ann-Marie Lurie in a release. Lurie expects it will still take some time before the supply of homes in Calgary balances out with the current demand. The average price of a home in Calgary is now $413,900, five percent lower than last year. 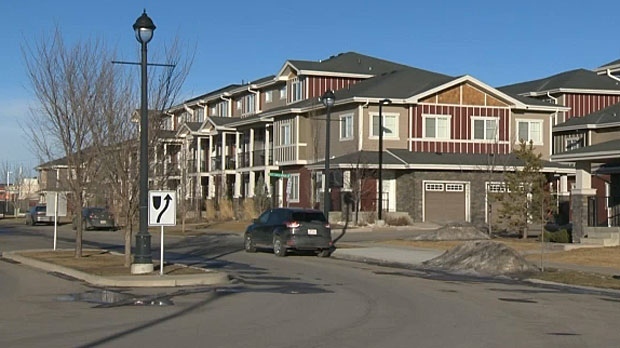 Real estate experts say home prices in Calgary will continue to slip until housing supply meets up with demand.